Response envelope: Matching pearlescent A2 size (4-3/8x5-3/4) champagne envelopes.70 lb paper. Sophisticated and Sweet DIY Wedding Invitation. Ivory pearlescent handmade paper wrapper and lush ribbon. 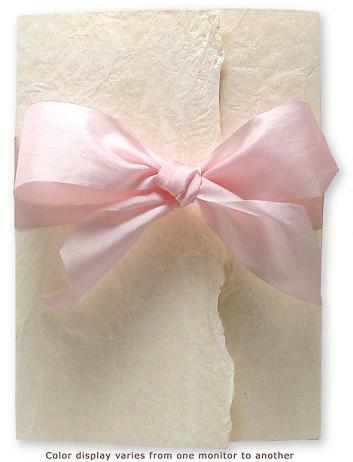 Elegant invitation wrapped in an ivory-colored, textured, pearlescent handmade rag-paper wrapper. Crinkled texture with one natural deckled edge. Wrapper is die-cut (ribbon slots) and scored for easy assembly and professional finish. Invitation card is a heavy champagne pearlescent Italian paper. Matching champagne pearlescent mailing envelope. Closes with a 1-1/2 inch Pale Pink textured ribbon.